A downspout is an essential piece of the water drainage system that protects a house. A downspout is basically an enclosed vertical gutter used for carrying rainwater from a rain gutter to ground level. There the water is directed away from the building’s foundation. The bottom of the downspout often has an elbow which directs the water away from the building. Gutter downspouts have an important job. In a heavy rainstorm, a large amount of rain water can land on your roof. When your gutter system is working correctly, the rain water flows quickly off the roof, into the gutters, and then gets channeled into the downspouts and drains away from your house. If there is any obstruction in your water drainage system, water backs up in the gutters and pours over the sides of your gutters, falling directly next to your house. This issue is possible whenever a gutter or downspout is clogged by leaves or other natural debris. 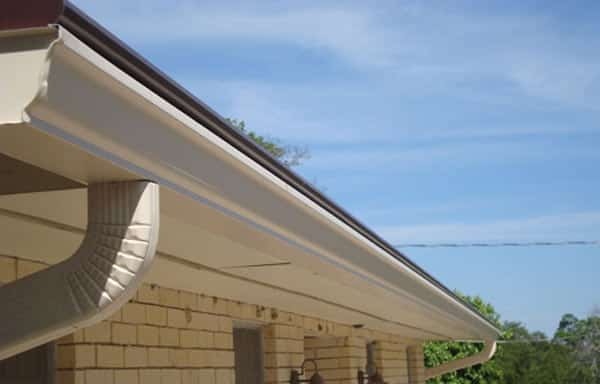 If the seamless gutters system you have on your home was not correctly installed, there can be issues with having the appropriate number of downspouts and adequate sloping on the gutter system as well. One common issue with downspouts is that they can become clogged pretty easily when leaves, twigs, and other debris accumulate within the downspout itself. A LeafLock gutter guard system can help your downspouts and rain gutter system protect your home’s foundation from water damage. There are many ways that Bruce Andrews Seamless Gutters LLC can help you protect your home from water damage. Please contact us today by calling 877.594.7449 or visit our contact page to send us an email.